Steenbok Nature Reserve Thanks all the dedicated members of Gardening @ Leisure for their continued support and guidance. 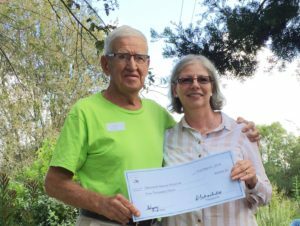 At their April meeting Kathy Michaelides, the Treasurer of Gardening @ Leisure once again presented Roger Voysey with a donation of R5,000. For the last fifteen years Gardening @ Leisure has made yearly donations to Steenbok Nature Reserve. In the early days when the club had less than 30 members the amounts were small; however they did help with buying trees and shrubs for the Indigenous garden. The talented club members also ran a plant sale at the annual Leisure Isle Festival, with all the proceeds going to Steenbok Nature Reserve. Later donations were used for benches, a sundial, plants, upgrading of the notice board at the entrance, the tool shed at Roger’s Way and the eradication of sword fern in Kingfisher Creek. The latter was the catalyst that inspired Roger, with expertise help from Esther Townsend, to tackle the invading Madeira vine, more sword fern, lantana, cestrum, and vinca. During most of 2018, with the help of Ivy Garden Services the invader plants were removed. Follow-ups will now have to be carried out for the next five or more years. Gardening @ Leisure’s donation of R 5,000 will assist in the cost of this eradication programme which has so far amounted to over R100,000!